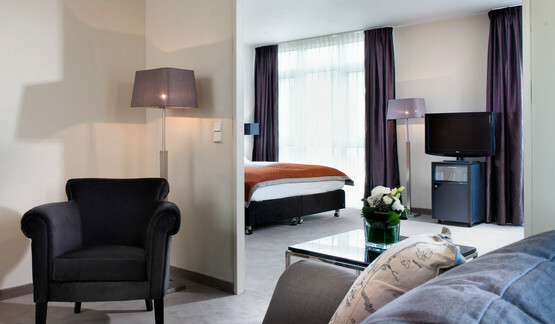 The Wyndham Hannover Atrium provides 222 attractive and modern hotel rooms, suites and apartments. Due to the size of 50 sqm the apartments are particularly recommendable for long stays and families. The apartments consist of a separate living and sleeping area and some of these have a fully-equipped kitchenette with dining table for up to 4 persons. These factors ensure the well-being of our hotel guests. In our hotel WiFi internet is available in all hotel rooms and public areas of the Wyndham Hannover Atrium. 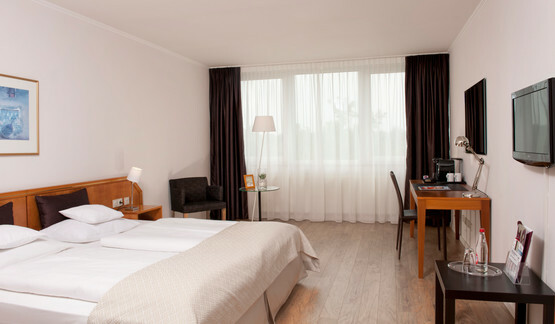 Standard Rooms at Wyndham Hannover Atrium Hotel – ideally designed to suit your needs. 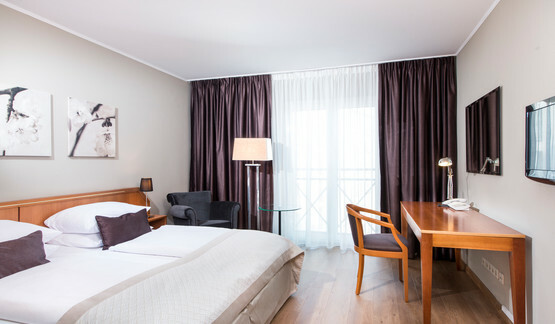 The standard rooms of our Wyndham Atrium Hannover Hotel offer a high-quality bed, tv, telephone, comfortable seating, a functional work desk with free WiFi internet access, minibar, hair dryer and bath tub. The superior hotel rooms of Wyndham Atrium Hannover Hotel offer you enhanced amenities: plenty of space, VIP bathroom amenities including a bath robe, tv, coffee or tea making facilities in the room as well as complimentary WiFi internet, air-conditioning, 2 bottles of water and 2 juices. The 15 apartments of Wyndham Atrium Hannover Hotel come with a size of 53 m² and provide a french bed, separate living and sleeping area, small kitchen, crockery including filter coffee on demand, dinner/meeting room for 4 persons, tv, telephone, bath with bathtub & shower, WC, big desk and minibar. 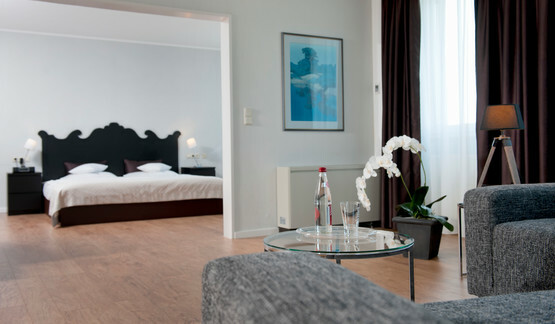 The apartments of the Hannover hotel are equipped with complimentary WiFi internet access. Partially free minibar: 2 bottles of water. The Junior suites of our hotel are equipped with air condition, coffeemaker with complimentary coffee, tea and hot chocolate. The junior suites provide free WiFi internet, flatscreen-tv, bath with rainbowshower, telephone, minibar, safe, desk and sitting facilities. The rate includes the free use of WiFi intenet access, 2 bottles of mineral water and 2 juices. The suite of our Hannover hotel offers the maximum comfort. With a separate living room and bed room, you can enjoy a maximum of space and privacy. The suite provides a large working area, complimentary WiFi internet, tv, a coffeemaker, air-conditioning, sofa, sitting facilities and minibar free of charge. Enjoy the VIP bathroom amenities with bathrobe. 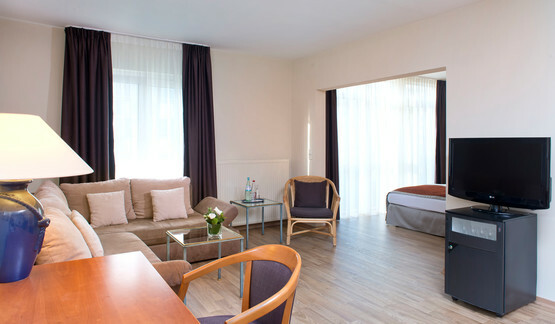 You have any question regarding the hotel rooms and equipment of Wyndham Hannover Atrium Hotel? Then please give us a call or send us an email! We will be happy to give you personal assistance!